You can quickly find out how much storage space is available on your iOS device, and perhaps more useful, the amount of storage space currently being used. 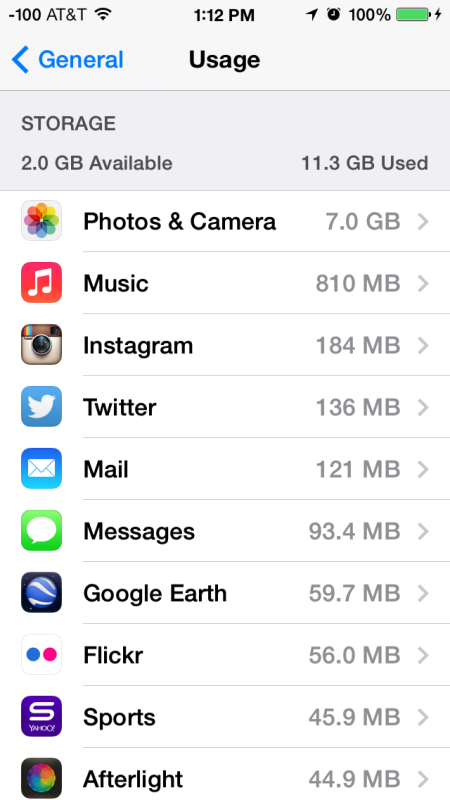 This same storage information screen also gives users details on how much space each specific app is taking up, and even shows how large your music, movies, and photos collection is. You can then select individual apps to get more detailed usage information. This is great because if you’re on the road and in a bind for disk space, you can quickly see what is hogging all the storage capacity and then delete an app or two. Previously you had to retrieve this information from iTunes with the iPhone, iPad, or iPod touch connected to a computer, making the ‘Usage’ menu another nice subtle enhancement to iOS’s post-pc feature set. You may notice that the “Other” capacity shown in iTunes isn’t displayed here, but instead is calculated to inclusion in the overall ‘Used’ space. 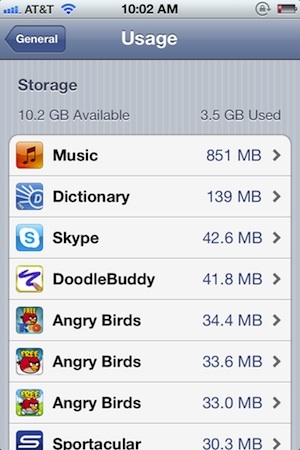 Some of the apps may surprise you, for example the Dictionary app shown takes up more disk space than Skype and all of the Angry Birds combined… that’s a lot of text. If you find that you have basically no free space available, take the time to follow some simple tips to free up space on any iPhone, iPad, or iPod touch. You’ll be able to reclaim much of your capacity in not much time at all, and you might be surprised to learn just where your space is compared to what you actually use. I am receiving an error message indicating my iPad is operating on low space. However, when I check space availability it is upwards of 13 GBs; why am I receiving this message?